A Russian military ship tracked by U.S. intelligence assets over the past two months as it sailed the western Atlantic arrived at a Caribbean port this week. 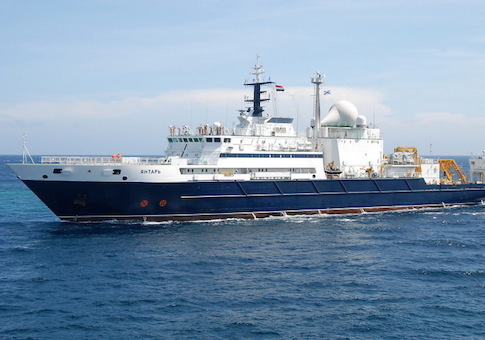 The research ship Yantar on Sunday sailed into the port of Willemstad, capital of the Caribbean island of Curacao, after transiting international waters off the southeastern United States. Maritime tracking data showed that it was near Aruba several days ago. The ship was spotted by naval vessel watchers as it entered the port, where it is expected to take on supplies. Pentagon officials have said the vessel was tracked from the north Atlantic on Aug. 24 as it sailed south through international waters along the U.S. east coast. The Yantar is a newly commissioned Russian military research vessel that is believed to be conducting anti-submarine warfare operations against U.S. ballistic missile submarines based at Kings Bay, Ga. The Yantar, launched earlier this year from a Baltic seaport, is equipped with cable-cutting gear and two deep-water submersibles. The ship’s activities in the Atlantic over the past several weeks also coincided with the deployment of the nuclear missile submarine USS Wyoming to Scotland. The U.S. Strategic Command, in an unusual announcement, stated that the Wyoming, home ported at Kings Bay, arrived at the British Naval Base Clyde, Faslane in Scotland on Sept. 16. Movements of ballistic missile submarines are normally kept secret by the Navy, and its dispatch to Europe comes amid heightened tensions with Russia over Ukraine and recent nuclear threats by Moscow against the NATO alliance. A Strategic Command spokesman said the Wyoming visit was routine and not directed at any adversary. A defense official, however, said one mission of the sub was "strategic assurance" for American allies in Europe in the facing of a growing Russian nuclear threat. 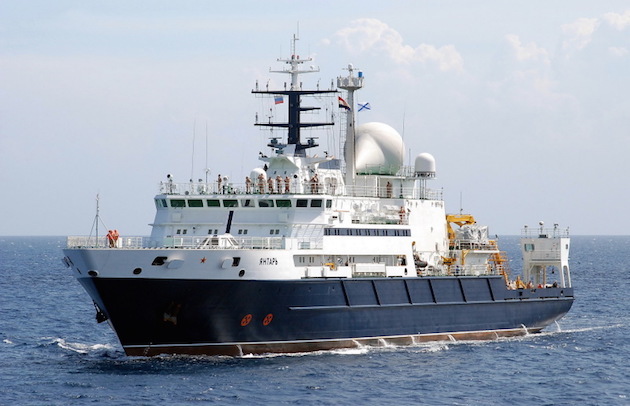 The timing of the Wyoming’s arrival indicates its departure from Kings Bay could have been detected or even anticipated by Russian military intelligence, which is the beneficiary of the Yantar’s underwater surveillance activities. Russia also has been known to deploy vessels similar to the Yantar in support of its attack submarines. It could not be learned if any Russian attack submarines were in the Atlantic at the same time the Wyoming crossed the ocean on the way to Scotland. However, defense analysts believe the Yantar is conducting underwater mapping and reconnaissance operations that would support future Russian submarine operations in the Atlantic. Other underwater activities likely include detecting underwater sensors and other equipment used by the Navy to track foreign submarine activities. The ship also can be used to identify key communications links used by the military, known as the Department of Defense Information Network or DoDIN. Russia is believed to be conducting reconnaissance on U.S. communications and information networks in preparation for information-based attacks in any future conflict. Moscow is engaged in a major strategic nuclear forces buildup that includes modernizing older submarines, as well as building a new class of missile submarines and a new class of attack submarines. The Washington Free Beacon also disclosed Sept. 8 that Russia is developing a nuclear-armed drone submarine code-named Kanyon that will be capable of wiping out entire port cities with a large-yield nuclear blast. One element of the Russian nuclear buildup is increased intelligence-gathering on U.S. nuclear forces. U.S. missile submarines are the backbone of the U.S. strategic force. The other legs of the triad include nuclear bombers and land-based missiles that are less survivable in a conflict than submarines. The Russian nuclear buildup also comes as Russian leaders in recent months have made alarming threats to use nuclear weapons against NATO in response to increased alliance defenses in Eastern Europe. The NATO defense buildup is being carried out in response to Russia’s military annexation of Ukraine, continued destabilization in eastern Ukraine, and threats to intervene in Eastern Europe. Russia also has threatened unspecific nuclear steps in response to NATO’s deployment of missile defenses in Europe, which are part of what the Obama administration calls the Phased Adaptive Approach of gradually building up increasingly more potent defenses in phases. The last phase will include ground-based SM-3 anti-missile interceptors in Romania and Poland. A Pentagon spokesman said earlier this month that the military was aware of the ship and that "we respect the freedom of all nations to operate military vessels in international waters in accordance with international law." 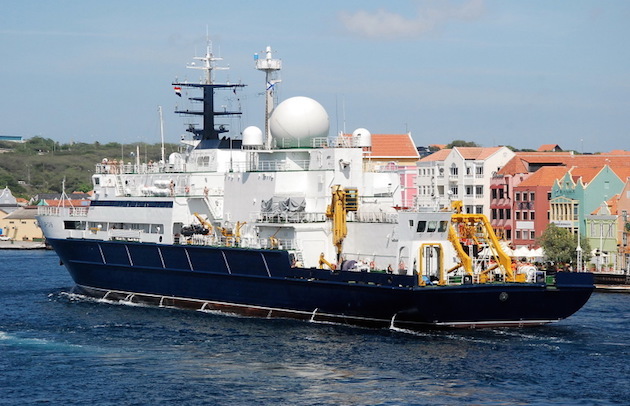 Photographer Cees Bustraan captured several images of the Yantar as it entered Willemstad harbor on Sunday. This entry was posted in National Security and tagged Russia. Bookmark the permalink.